Hey Alexa — the Internet of Things (IoT) has come to the farm. The technology behind Amazon and Google’s smart home devices that allows consumers to make toast, lock their door, and start their SUV over the internet is starting to revolutionize how farmers manage their operations. The IoT refers to any sensors and devices that have the capability to connect to the internet. Cisco Internet Business Solutions group predicts that there will be 50 billion connected devices by 2020. McKinsey Global Institute projects that it could deliver up to $11 trillion dollars in economic value by 2025. Dairy farmers have been among the first to adopt the technology. They’re routinely using connected devices to feed and milk their cattle as well as to track individual animals movement and monitor their health. Cash croppers are using them for everything from monitoring growing conditions to controlling irrigation systems. So even though the technology is new, there are endless lists of IoT products available that can enhance a farm’s operation. 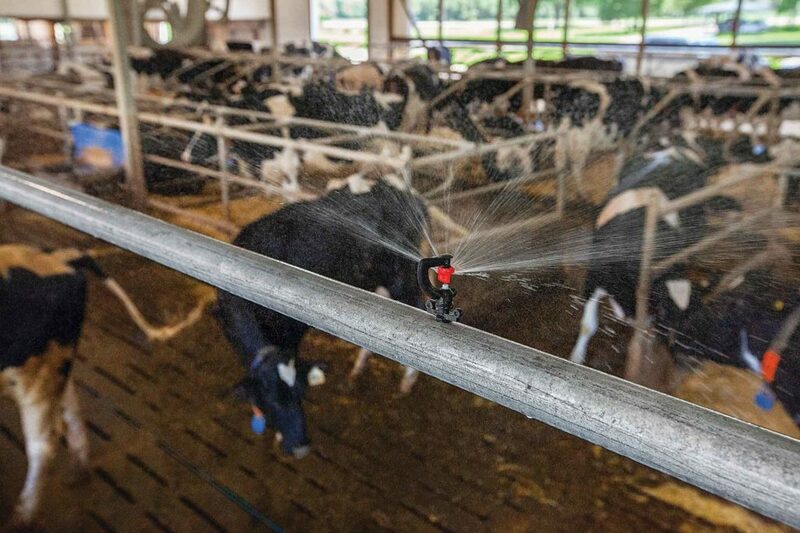 Many companies offer remote sensors that monitor temperatures in livestock barns. They will send emails or text alerts to a designated person when temperatures rise above a preset level and activate fans, cooling sprinklers, or foggers. Changing the channel. The technology is being adopted rapidly for the same reason that the television remote control caught on so quickly a generation ago; it makes users’ lives easier. Older farmers can remember walking to the television and turning a dial to change the channel or adjust the volume. There was nothing difficult about it, but it’s much more convenient to stay on the couch and do it with a remote control. Likewise, you could physically go from bin to bin and site to site, to manually check your grain’s temperature and moisture levels using a probe or by plugging into the sensor cables. You could turn the aeration fans on or off as needed while you were there. However, the latest IoT models, like the OPI Blue, allows you to do all this from anywhere in the world with a smartphone or tablet. Since wireless remote bin storage technology makes monitoring stored grain simple, a farmer could check all their bins as often as they like for their peace of mind. They can even program them to automatically send text or email alerts if any issues arise. These systems are so new that only a handful of farmers now have them. But if the amount of interest they’re attracting at farm shows is any indication, they’ll be common in a year or two. Similar devices are now readily available to control the environment in hog, chicken, and dairy barns too. Fans, sprinklers, or fogger cooling systems are set to activate whenever the temperature rises above a predetermined limit. They also can be programmed to automatically text or email a designated contact person if anything goes wrong. The robots have made quantifiable improvements to their farm’s bottom line, Carl Landry says. But perhaps their biggest benefits are in the improvments they’ve made to the brothers’ quality of life. Until recently, consumers had to use different apps to run all their smart home devices. But the rapid adoption of Amazon’s Echo (Alexa) and Google’s Google Home has forced developers to make their devices compatible. Rob Saik, the founder of Agritrend in Red Deer, Alberta, believes something similar will happen with the smart farm, too. 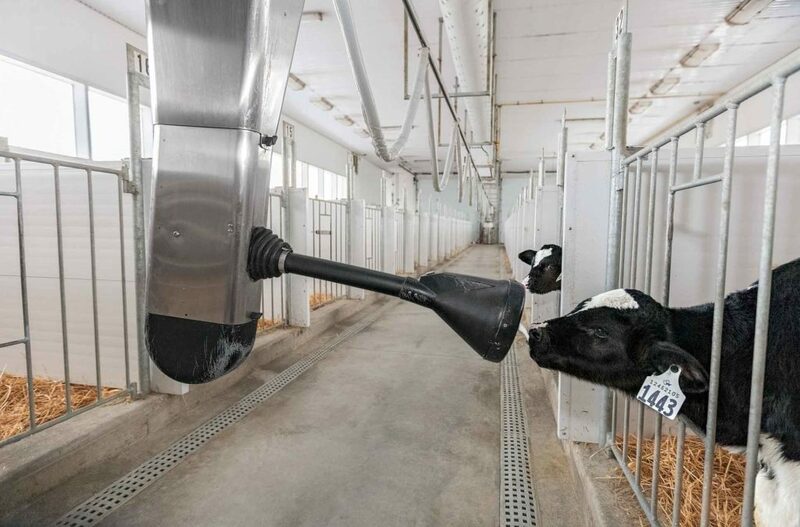 Dairy farmers are routinely using connected devices to feed and milk their cattle as well as to track individual animals movement and monitor their health. of them. The technology requires a reliable fixed and/or mobile broadband internet connection. While most Canadian farmers have at least one internet service provider (ISP) offering some broadband service to their farmyards, their American counterparts have more limited access. (For more on this see, “The Digital Divide” at johndeerefurrow.com). Only the most fortunate in both countries have access to the affordable fast connections that urban businesses take for granted. A lot of the research and development focus is now on utilizing low-power wide-area networks (LPWAN) to support the IoT, says Ken Jackson, CEO with Intelliconn Communication Solutions in Saskatoon, Saskatchewan. The two types that are attracting the most interest are LTE-M (Long Term Evolution Category M1) and LoRa (long range low power). LTE-M’s biggest advantage is the devices are cheap and it’s fairly simple for mobile phone companies to tack it on to their existing LTE cellular towers. It’s great for connecting low powered battery-operated devices. One of their great advantages is they have the capacity to go into a sleep mode and only power up for periodic connections. LoRa networks are significantly more complex. They send packets of information from a node, say a field moisture sensor, up through a gateway and into a cloud network. Their biggest advantage is the data they send is encrypted so it’s a lot more secure. It’s still possible to utilize IoT technology as long as you have access to a broadband connection on your farm. Jackson’s company uses radio technology to create a WiFi internet mesh or dome that provides seamless internet coverage across your farm. Biosecurity is becoming more important all the time as farms grow larger. Driveway sensors and security devices alert you when someone enters the farmyard so you can identify whether it’s someone who should be there. Each component automatically transfers data from one unit to another in a seamless mesh so the signal isn’t encumbered by obstacles in the field, Jackson says. However, the data bandwidth is cut in half each time it switches through a hub so the practical coverage limit is a three-hop jump. So that would provide you with a dome that’s somewhere between 10 and 15 kms in diameter. Many farmers want it for cameras, Jackson says. Initially people got them to increase their operational visibility but Jackson says most are now buying them for security purposes to know who’s coming and going. Cameras create special problems for data management though. Most IoT devices just send bytes of data, not megabytes, but even small image and video files are orders of magnitude larger. 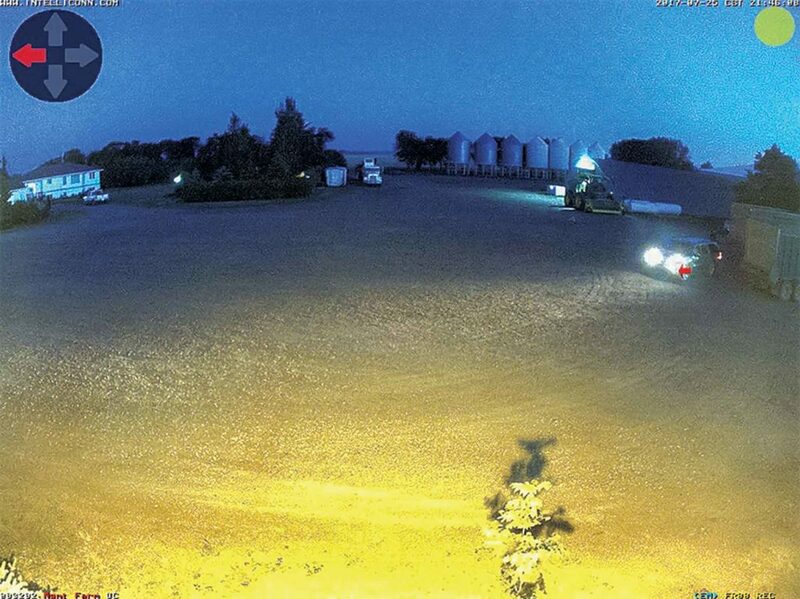 Ryan Enns installed a wireless mesh over his dairy farm near Warman, Saskatchewan. He uses WiFi connected cameras to monitor when a cow was calving and keep track of who’s coming into his farmyard. It also made it possible to have an internet connection in his shop. Simplifies your life. It’s still the dawn of the IoT age and farmers are struggling to determine how to integrate these devices into their operation. But all indications are that they will simplify so many common tasks that they will quickly change producers’ day to day routine. After all, when was the last time you changed the TV channel without a remote?